If you want to add to your web site that is fine, I got my information from someone kind enough to answer a post I put on the Nemaha Co. Board on Genforum. I have no other cemetery information for this family. 1     7    5      Kelso, Annie Pearl      3 yrs. 1     7    6      Kelso, Harry            2 yrs. 1     7    4      Kelso, Nellie           5 yrs. 1     7    3      Kelso, Tommy           16 yrs. 2    16    2      Kelso, Daniel W.   1841 - 1916 Co.I, 3rd IL. HOLDREGE, Neb. - Leo G. Kelso, retired co-owner of Sidles/Mister Automotive, died Thursday at a hospital in Lincoln, Neb. He was 71. Funeral will be at 2:30 p.m. Monday at First Presbyterian Church in Holdrege, where he was a member. Burial will be in Highland Park Cemetery in Ravenna, Neb. Nelson Funeral Home in Holdrege is in charge of arrangements. Mr. Kelso was born in Grand Island, Neb. ; he lived in Ravenna for many years and in Holdrege for 41 years. He was a Navy veteran of World War II. Survivors: Wife of 48 years, Lenore Kelso of Holdrege; son, Greg Holdrege of Fort Worth; daughter, Annette Morris of Kearney, Neb. ; two sisters, Maxine Boucher and Charlotte Fox, both of Ravenna; and three grandchildren. This Cemetery is located about 7 miles north of Inavale,Webster County,Neb. 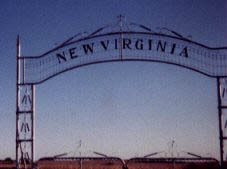 If you go north out of inavale on a road juston the west side of the town proper and head for the New Virginia Church which is about 71/2 miles you will see a road just south of the church head west for about 1/2 to 1 mile and the New Virginia Church sits on left. CENTRAL CITY -- Raymond Steven Kelso, 75, of Central City died Monday, Jan. 18, 1999, at Midlands Medical Center in Papillion. Services will be at 2 p.m. Thursday at Solt Funeral Home in Central City. The Revs. Debra Tompsett-Welch and Bob Neben will officiate. Military rites will be conducted by the Fort Riley Honor Guard. Burial will be in St. John's Cemetery at Kronborg. Visitation will be from 5 to 7 p.m. Wednesday at the funeral home. Mr. Kelso was born on Aug. 31, 1923, at Riverton to Oak Lee and Anna Elizabeth (Juggert) Kelso. He graduated from Riverton High School in 1941. He entered the U.S. Navy in December 1941. He served in the Pacific theater during World War II and also served in Korea and Vietnam. He married Helene Jacobs on Jan. 19, 1955, in Franklin. He retired from the military in 1968. After his retirement, he moved to Central City. He worked at the Cornhusker Army Ammunition Plant near Grand Island, Dickinson Construction in Marquette for several years and Atlantic Homes in Central City for about 15 years. He enjoyed fishing, woodworking and driving around the countryside to check on crops. Survivors include two sons, Vaughn Kelso of Hickman and Steven Kelso of Central City; three daughters, Victoria (Mrs. Allen) Smith and Margaret (Mrs. Rick) Polzkill, both of Papillion, and Pamela (Mrs. Craig) Tunks of Central City; 11 grandchildren; one great-grandchild; and one sister, Mildred Kelso of Holdrege. He was preceded in death by one son, Vernon Kelso; three brothers, Don, Bob and Gerald Kelso; three sisters, Maxine Kelso, Helen Smith and Maybelle Kelso; and his former wife.